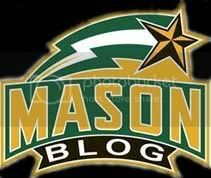 George Mason Basketball: What have George Mason practices been like so far? A lot of running. What have George Mason practices been like so far? A lot of running. If your coach really wanted to make a point, it was a timed exercise and if you didn't all make it in that time...it was back "on the line". In a pre-dawn practice a week before the men's basketball team would have their opening exhibition game against Lycoming (October 31st at the Patriot Center, 7pm) new coach Paul Hewitt was making such a point to a group of players. Late in getting to their spots in a particular drill, Hewitt decided it was time for a little discipline. "Gold team...on the line". Five guys hung their heads, lined up along the baseline and waited for the next command, "go!" Thirty-five seconds later, all but one in the group of five finished their penalty run on time, but four out of five isn't enough. "Back on the line." The same scene played out two more times with the same four of five players making it. Coach Hewitt had seen enough and made it quite clear to the veteran player failing to make the run in the allotted time that he was less than pleased with the effort. That's putting it kindly. The next run, all five players crossed the line in time. We had heard some whispers that Hewitt wanted an uptempo style of play this season from his players and it looks like they are going to be in impressive shape at the beginning of this season. What's interesting is that we also heard that Hewitt might often go with a lineup that includes Erik Copes, Ryan Pearson, and Mike Morrison; will they still be uptempo with those three on the court at the same time? Just add that to the list of many questions that surround this team. This news encourages me as a mason fan. With all the hype coming into this season and the preseason votes, maybe some players thought that they deserved a great season before it started. Hewitt sounds like he is being tough and them and making the point that they haven't earned anything yet and that they will have to work hard to replicate last year. I hope his discipline is going over well and the players understand the need for conditioning. Really excited to see the exhibition game on Monday to get an idea of what we have in Copes, Gray, and Wright. So wait, that one commenter got up at 6 am and did a write up?